Could the Montage Pro Massage Char Put Omega Ahead of the Competition? Massage-chair-relief.com introduces a new massage chair that combines the very best of Omega technology. Massage-chair-relief.com announced this week that they are adding the Omega Montage Pro model to their fleet of massage chairs. Omega has been an increasingly competitive company in the field of massage chair design and their latest release could see the brand catapulted to the forefront of the industry. But what makes the Montage Pro stand out from the crowd? Omega named the new chair “montage” and the name alone proves just how confident Omega is that their new chair is a physical representation of the very best of their technology. So, what’s under the hood? It seems as though Omega has looked to the future with the Montage Pro and this is instantly notable from the sleek, progressive aesthetics of the chair. If you are looking for a chair that blends inconspicuously into the home, this may well not be the massage chair for you, but if you are looking for a chair that is futuristic in both function and style, the Omega Montage could be the new choice. The functions of the chair are something to behold. But this does not mean that the memorization of a manual is necessary before use. Thankfully Omega realized that the majority of their market is not part of the iGeneration, so the controls are intuitive and accessible, thanks to the simple sub-remote controls. This is technical progression without the loss of approachability. With a professional introduction courtesy of Dr. Weidner of http://massage-chair-relief.com, the chair was familiar within a matter of minutes. Introduction began with a very impressive feature of the Montage Pro- the musical therapy feature. Omega is hoping to separate from the competition by focusing on a holistic approach to massage loungers. Synchronizing music to the Montage Pro is surprisingly simple as the mp3 player is compatible with Windows 2000/XP/Vista/Windows 7. Music can also be stored directly on the chair thanks to a USB “Music Stick”. Being able to listen to music on the chair is just the beginning; the chair can actually synchronize the massage rollers to the rhythm and BPM of music. Infinite melodic possibilities via the intelligent massage rollers. Air pressure massage is another focus of the Montage Pro. The air pressure feature aims to give a realistic simulation of the movements of a master massage therapist. Unlike other chairs on the market, the Montage Pro air pressure feature covers the whole body including the arms, hands, shoulders, neck, head, obliques, buttocks, thighs, hips, calves, and feet. The all-encompassing air pressure ensures that no problem area is left untouched and for an all over massage; this chair cannot be beaten in its class. One of the greatest and most unique features of the Montage Pro is the roller system in the feet. To complement the airbags in the calves and feet, a set of rollers are strategically placed in the bottom of the foot massagers to aggressively massage the soles of the feet. The Montage Pro is one of the very few massage chair models that has a roller system in the feet. 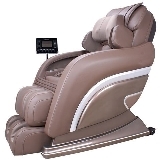 Traditionally, massage chairs have airbags along with a plastic or rubber plate under the feet. The rubber plate has nodules that are pressed against the feet by the airbags. Rollers are actively engaged in passively massaging the feet, just like the roller system in the chair back. This makes for an exquisite foot massage that you won't find anywhere else. Dr. Weidner is proud to be offering the Omega Montage Pro online at http://www.massage-chair-relief.com and at his physical location in Taylorsville, Utah. For more information on the features and functions of the Omega Montage Pro, contact Dr. Alan Weidner in person on 801-417-8240 or visit http://www.massage-chair-relief.com/massage-chairs/omega/omega-montage-pro/ to read more information on the Montage Pro.